The superstitious man is to the knave, what the slave is to the tyrant; nay more — the superstitious man is governed by the fanatic, and becomes a fanatic himself. Be it observed, that the most superstitious times have always been those of the most horrible crimes. Frequently attributed, but unsourced. Also attributed to Kevin Alfred Strom (1993) "To determine the true rulers of any society, all you must do is ask yourself this question: Who is it that I am not permitted to criticize?" Life is thickly sown with thorns. I know no other remedy than to pass rapidly over them. 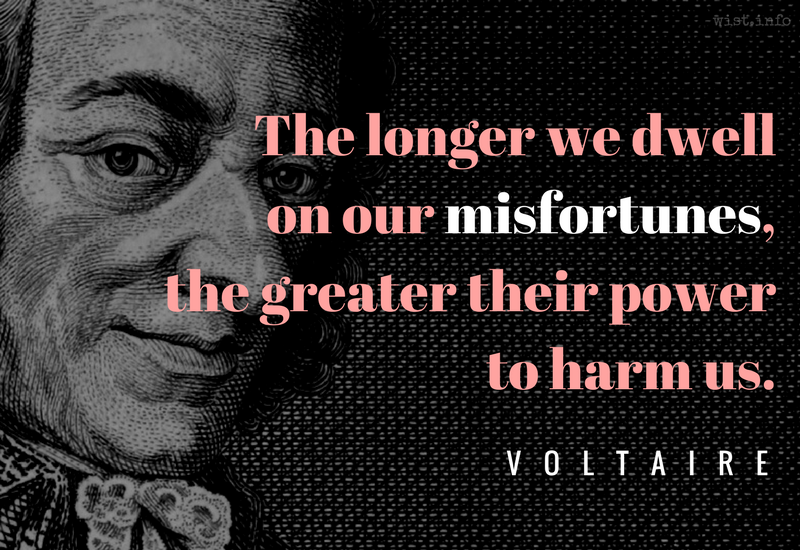 The longer we dwell on our misfortunes, the greater their power to harm us. 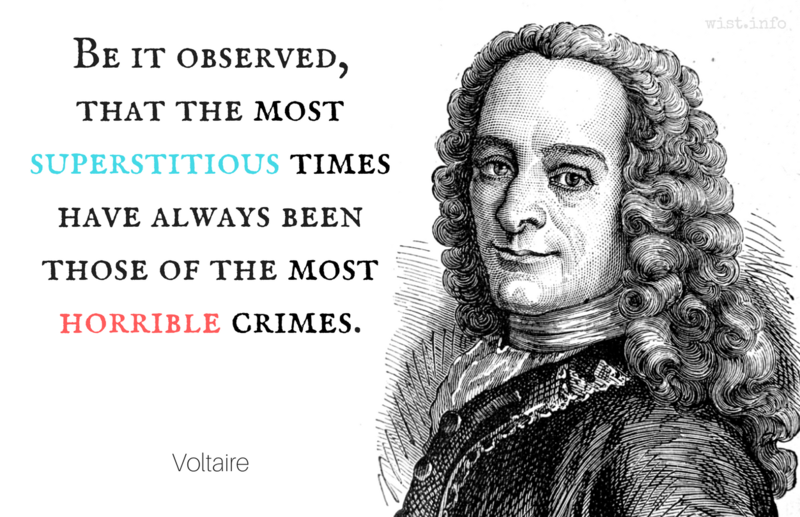 In The Lady's Magazine, "Anecdotes of Voltaire" (Jul 1786). God is a comic playing to an audience that’s afraid to laugh. Actually, Pierre de Beaumarchais, Le Barbier de Séville (1775), I.ii, "Aujourd'hui ce qui ne vaut pas la peine d'être dit, on le chante" ["Nowadays what isn't worth saying is sung"]. Also, Joseph Addison, The Spectator (21 Mar 1711), who spoke of "an establish'd Rule, which is receiv'd as such to this Day, That nothing is capable of being well set to Musick, that is not Nonsense." 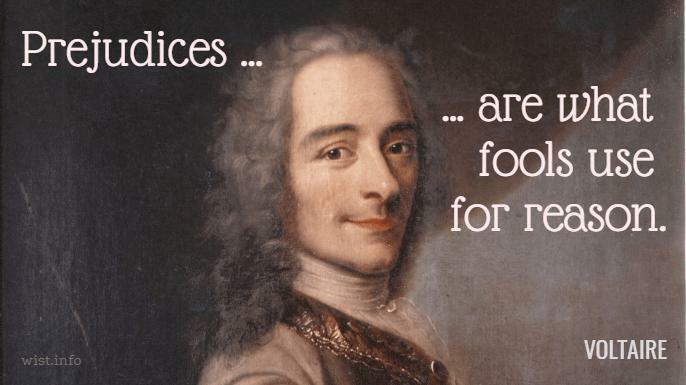 The words are not found in any Voltaire and actually belong to historian Evelyn Beatrice Hall, writing as S. G. Tallentyre in The Friends of Voltaire (1906), describing an 1759 incident where Voltaire learned that Claude-Adrien Helvétius' book On the Mind [De l’esprit] had been burned (along with Voltaire's own "On Natural Law") after condemnation by the Paris Parliament and the Sorbonne. ‘What a fuss about an omelette!’ he had exclaimed when he heard of the burning. How abominably unjust to persecute a man for such an airy trifle as that! ‘I disapprove of what you say, but I will defend to the death your right to say it,’ was his attitude now. Hall later wrote to a friend that the actual words were her own and ought not to have had quotation marks. I wholly disapprove of what you say -- and will defend to the death your right to say it. Monsieur l’Abbé, je déteste ce que vous écrivez, mais je donnerais ma vie pour que vous puissiez continuer à écrire. What is tolerance? It is the consequence of humanity. We are all formed of frailty and error; let us pardon reciprocally each other’s folly — that is the first law of nature. All styles are good, except the tiresome kind. We use ideas merely to justify our evil, and speech merely to conceal our ideas. Alt. trans. "If God created us in his own image we have more than reciprocated." Virtue debases itself in justifying itself. Our wretched species is so made that those who walk the beaten path always throw stones at those who teach a new path. What is madness? To have erroneous perceptions and to reason correctly from them. This is the character of truth: it is of all time, it is for all men, it has only to show itself to be recognized, and one cannot argue against it. A long dispute means that both parties are wrong. I fear that in this world one must be either hammer or anvil. If I had to choose, I should detest the tyranny of one man less than that of many. A despot always has his good moments; an assembly of despots never. Nothing is so common as to imitate one’s enemies, and to use their weapons. [L’Éternel a ses desseins de toute éternité. Si la prière est d’accord avec ses volontés immuables, il est très inutile de lui demander ce qu’il a résolu de faire. Si on le prie de faire le contraire de ce qu’il a résolu, c’est le prier d’être faible, léger, inconstant; c’est croire qu’il soit tel, c’est se moquer de lui. Ou vous lui demandez une chose juste; en ce cas il la doit, et elle se fera sans qu’on l’en prie; c’est même se défier de lui que lui faire instance ou la chose est injuste, et alors on l’outrage. Vous êtes digne ou indigne de la grâce que vous implorez: si digne, il le sait mieux que vous; si indigne, on commet un crime de plus en demandant ce qu’on ne mérite pas. You are perfectly right, Sire. A wise and courageous prince, with money, troops, and laws, can perfectly well govern men without the aid of religion, which was made only to deceive them; but the stupid people would soon make one for themselves, and as long as there are fools and rascals there will be religions. "Doubt is not a very agreeable state, but certainty is a ridiculous one." I have never made but one prayer to God, and very short one: “O Lord, make my enemies ridiculous.” And God granted it. “If God did not exist, it would be necessary to invent him.” I am rarely satisfied with my lines, but I own that I have a father’s tenderness for that one.